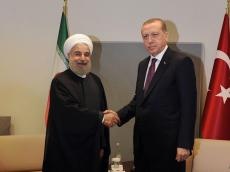 Turkish President Recep Tayyip Erdogan will hold a phone talk with Iranian President Hassan Rouhani, the Turkish media reported April 17, referring to Erdogan's statements. Erdogan said that the situation in Syria will be discussed during the conversation. He noted that on April 16, he had a phone conversation with the leaders of several countries. Regarding the Syrian policy, the president of Turkey said that the country has its own interests in Syria. On April 14, Joseph Dunford, Chairman of the US Joint Chiefs of Staff, said that the US and its allies fired more than 100 missiles at Syria and three main chemical weapons facilities were targeted by missiles from both the sea and aircraft, which triggered Syrian air defenses. Dunford acknowledged the strike was designed to degrade Syria’s chemical weapons capability without killing civilians or the many foreign fighters in Syria’s multi-sided civil war.